Have you been seriously injured in a car accident, motorcycle accident or trucking accident in the Annapolis, Maryland or Glen Burnie, Maryland areas? Do you know that according to Maryland personal injury law you may be entitled to benefits, damages and financial compensation for your injuries, pain, suffering, lost wages and vehicle repair costs? To discern exactly what benefits you may be entitled to, as well as the amount of monetary compensation, contact our Annapolis Maryland car accident lawyers today. Please do not hesitate to contact our Annapolis Maryland car accident lawyers for a free initial consultation. Dial (410) 321-8860 today. Mr. Turnbull handles all accident cases on a contingency fee basis meaning he charges no fee unless he recovers for you. Proudly serving Anne Arundel County, Baltimore County, Harford County & Howard County, MD. According to studies done by the Maryland Motor Vehicle Administration (MVA) auto accidents are the number one killer of people between the ages of 4 to 34. Various types of auto accident kill more people in Maryland than homicides. An overwhelming majority of car accidents (90%) in the state of Maryland are preventable as they are caused by driver error and include behaviors such as drunk driving, speeding and careless driving. Annapolis, Maryland is located in Anne Arundel County, MD and has a population of just under 38,000 people. Annapolis is also the county seat which means that is where the courthouse and most government offices are located. The entire Annapolis, Maryland area is very rich in culture and history being the home of the United States Naval Academy. Annapolis is also the capital of Maryland. Many major roads, highways and interstates run through the Annapolis area including I-97 and Route 50. 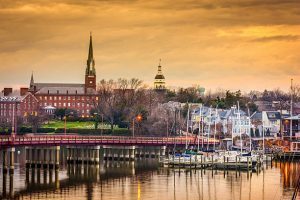 With so much to see and do the Annapolis, Maryland area has tens of thousands of people traveling to and from Annapolis, MD on a daily basis. With that, auto accidents, trucking accidents and motorcycle accidents occur on a daily basis in Annapolis, Maryland. If you have been injured in an Annapolis Maryland auto accident it makes sense for you to consult with an Annapolis Maryland injury attorney handling car, truck and motorcycle accident claims. If you or a loved one need any of the following do not hesitate to contact the Annapolis Maryland car accident lawyers at our firm for a free consultation. Lost wages compensation including past, current and future lost wages. Vehicle repair costs including vehicle and personal property damaged in the accident. Medical benefits including long term care, ER bolls, surgeries, medication and therapy costs. Death, funeral and survival benefits in the event someone was killed in the accident. Each auto accident case is different and the actual benefits you are entitled to will be determined by the circumstances and surrounding the accident. Our experienced Annapolis Maryland auto accident attorneys will be able to identify all liable parties as well as and benefits you are entitled to. Following a car accident you should seek medical care immediately. This is true even if you do not feel ill, sick and are not in physical pain. Immediately after being injured in a car accident you may be operating at a higher level of excitement due to adrenaline pumping and possibly being in shock caused by the accident. Neglecting to get medical care after the accident may jeopardize your personal injury lawsuit. At the accident scene it it wise to take pictures of the scene and get contact information from witnesses. You should also call the police even if there is minimal property damage. From there it is imperative that you contact a personal injury attorney serving the Annapolis and Baltimore areas. You can rest assured that our Annapolis Maryland car accident lawyers will thoroughly analyze your claim and determine any benefits and forms of financial compensation you may be entitled to according to Maryland auto accident laws. Maryland personal injury law allows an injury victim to file a personal injury and or wrongful death up to 3 years from the date of injury or date of death. However the longer you wait the more difficult it may become to get the benefits and compensation you are entitled to. One of the most cumbersome tasks associated with being injured in an auto accident is dealing with the insurance companies. The adjusters who work for the insurers know that you are most likely emotionally, physically and financially vulnerable after an accident. They will prey on this and offer you a very quick cash settlement. You may be inclined to take it as without an Annapolis auto accident attorneys on your side you will not know your rights and exactly what benefits you are entitled to. Do not communicate at all with the insurance carriers. Let us handle them on your behalf. Our Annapolis Maryland car accident lawyers will conduct a thorough and detailed case review. From there they will determine exactly how much compensation you should be given and what benefits you deserve. The insurance carriers will only offer you a fraction of what you truly deserve. If you, or a loved one, have been injured due to the negligence of another in Annapolis, Bel Air, Towson or Glen Burnie areas do not hesitate to call our Annapolis Maryland car accident lawyers to discuss your rights and how to protect them. Let our Annapolis Maryland car accident lawyers put their many years of experience handling accident and injury claims to work for you. They will handle all administrative aspects of filing your claim and deal directly with the liable parties insurance carrier on your behalf. In addition to offering free consults they also operate on a contingency fee basis meaning he charges no fees unless they recovers for you.